SHOT #11 ON OCTOBER 11 IS IN A LINE THAT FORMS A SATANIC PENTAGRAM ON THE GROUND IN MARYLAND, WASHINGTON, D.C. AND FREDERICKSBURG, VIRGINIA. ORIGINAL BROKEN CROSS PATTERN PACKS POWERFUL WALLOP IN MESSAGE TO FUNDAMENTAL CHRISTIANS! Title: SHOT #11 ON OCTOBER 11 IS IN A LINE THAT FORMS A SATANIC PENTAGRAM ON THE GROUND IN MARYLAND, WASHINGTON, D.C., AND FREDERICKSBURG, VIRGINIA. ORIGINAL BROKEN CROSS PACKS POWERFUL WALLOP IN MESSAGE TO FUNDAMENTAL CHRISTIANS! Subtitle: As we plotted the precise location of each of the 11 shootings thus far in Maryland, we now realize that these shots form a Satanic Pentagram. However, the message delivered by this pentagram is somber beyond belief for Fundamental Christians, who are the only true enemies the Illuminati recognizes. With these shootings coming as the U.S. whirls toward the planned war with Iraq, this message drives home the point that it is later than you might think! "FREDERICKSBURG, Va. -- A fatal shooting at a gas station here Friday set off a huge manhunt that brought Interstate 95 to a crawl for hours, in what police say is likely the latest strike by a serial sniper terrorizing the Washington area. In driving rain and heavy mist, the gunman somehow slithered through the police dragnet, despite the fact that the latest attack was among the most daring -- the 53-year-old victim was shot a short distance from a state trooper who happened to be across the street at the time." "Bullet fragments were being analyzed Friday night, but investigators said the shooting of Kenneth H. Bridges of Philadelphia as he pumped gas into his car appeared to fit a pattern that began Oct. 2 in Montgomery County. The Washington Post, citing law enforcement sources, reported on its Web site Friday night that the latest shooting was 'conclusively' linked to the sniper attacks." * NEWS1533 -- "Massive Attack Against American Cities! Is The Beginning of the Terrors Planned To Accompany World War III?" * NEWS1538 -- "More Occult Signatures To The Attack On The Pentagon and the Twin Towers"
* NEWS1541 -- "September 11, 1990, President George Bush Delivers Speech To Congress Entitled 'Toward A New World Order'; On September 11, 2002, President George W. Bush Is President As Pentagon and World Trade Centers Are Attacked. Two Events Are Precisely 11 years apart!" Truly, the number '11' is most important to the occultist, for he believes that a good plan must be carried out "by the numbers" if it is to succeed; a good plan might fail if it is carried out by the wrong numbers. Therefore, an occultist will execute his plan according to occult numbers that he feels will give him the best chance to succeed. This number '11' is most important, for it is the Biblical and the Illuminati number for Antichrist. In our second article on these shootings -- NEWS1710, we demonstrated that the first six shots formed a perfect Broken Cross; if you have not examined this article yet, we encourage you to do so now, so you will be better prepared for the information contained in this article. * The shooting pattern of these first six shots of October 2-3 proved that the shootings contained an occult, Anti-Christian basis; a Broken Cross is not only a symbol of Antichrist, but a symbol of Satan's wish and ultimate plan to annihilate Christianity. Days later, a Tarot Card was discovered at the scene of the Bowie Middle School, Shooting #9. However, this Tarot Card was a very special card within the deck; it was card #13, the Death's card. Thus, the occult basis for these shootings is established beyond either doubt or argument. * It is highly critical for a practicing Satanist to put symbols on the ground, for a couple of reasons. First, a witch must first put the required symbol on the ground before he/she can begin to perform the specific ritual planned. Therefore, you have to ask a question as to whether a powerful ritual is planned in this area using the symbols placed on the ground; we shall come back to this subject later in this article. Secondly, Satanists believe that a symbol begins to emit demonic power as soon as it is placed upon any medium, whether it be the ground, a piece of paper, or on canvas. Symbols are believed to be transfer points of power between the demonic realm and the material realm called Earth. This belief is why our nation's Government Center -- The Mall -- is shaped in the Sephiroth Tree of Life -- NEWS1399; additional Satanic symbols were placed upon the ground from the White House to the Capitol to the Washington and Jefferson Memorials -- NEWS1040, NEWS1081. * The Tarot Card system is established on the Sephiroth Tree of Life. Since the world's largest Sephiroth Tree of Life is located just a few miles to the south from these original shooting locations, we could only marvel at whether this current pattern on the ground might not be related to the Tree of Life symbol in Government Mall in Washington, D.C.
* These shootings began October 2, which is the beginning of the annual Satanic celebration of the Hindu Goddess Kali. The Goddess Kali, is a "Warrior Queen", the "only one who could restore harmony and set the world at peace". Her major weapons are the ax and the sword, with which she will knock the existing paradigm down so a new one could be restored. Isn't this exactly what the Illuminati plans to do? Of course, it is. * The Broken Cross is used in Satanic ceremonies for incantation and condemnation. We wondered at this time if the most important ritual symbol of all time within Satanism -- the Pentagram -- might not be the ultimate pattern. As we went to print on October 4, other shootings had occurred that fit outside this pattern of the Broken Cross formed by the first six shots; however, we felt strongly that the integrity of these first six shots stood on their own, no matter what ultimate pattern might develop. How right we were, as you shall soon discover! As you can see, the shots occurred at great random, making it difficult to see exactly what kind of symbol might be created by the shot locations. Please allow me an explanation as to how we located the exact spot of each shooting location. We did not take the general location as news reports gave them; rather, we kept digging until we found the exact street address of each shooting, and then we used Map Quest to discover the proper location. Then, we used a rather sophisticated map program to plot the dots. The location of these dots on the map here, and especially on the colored map below, are absolutely correct. 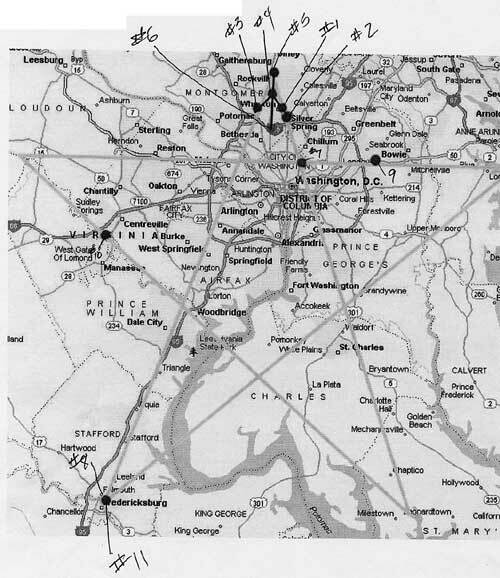 If you go strictly by the news reports, you would be off; for example, both the Bowie Middle School and the Manassas shootings were actually located some distance from those locations. Only when we exactly placed the dots representing the shooting location did the true symbol appear. SATANIC SYMBOL FORMED ON THE GROUND IS A PENTAGRAM! The pattern formed by these 11 shots is the Pentagram, as you can see from this map. We connected the original Broken Cross with a blue line and then we drew the lines of the Pentagram formed by the shots that told us a line should be placed there. Thus, Shots 7 and 9 told us that a line should be placed there, running through both locations. Shot #10, which reportedly occurred near Manassas, Virginia, told us that a line should be there. Finally, Shots #8 and #11 in Fredericksburg told us that a line should be placed with that spot as an anchor spot. Understanding the angles of both a Pentagram and a Hexagram, we "connected the dots" and realized that these shootings had formed a Pentagram on the ground! 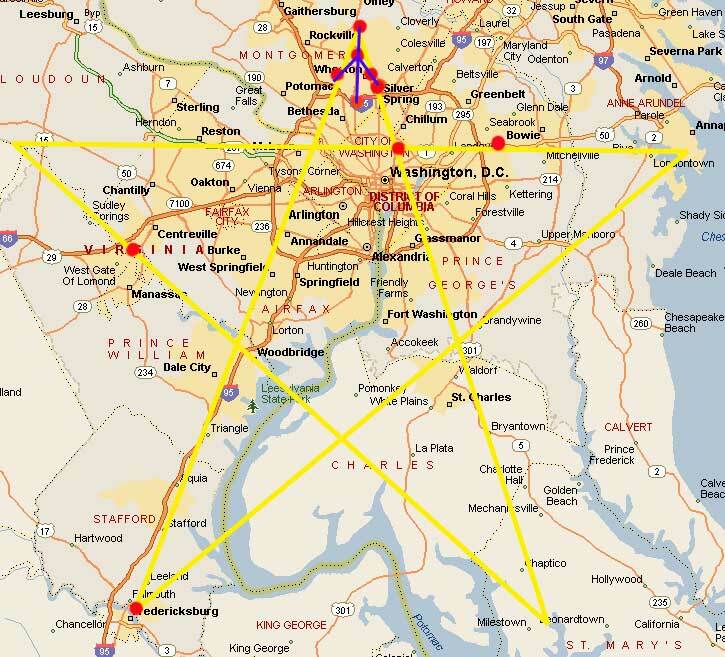 This Pentagram is very large, extending from approximately Rockville, Maryland, to the north, to Fredericksburg, Virginia, to the south. Encompassed within this Pentagram is the whole of Washington, D.C., and all of government center. This fact means that this Pentagram engulfed the Satanic symbols in the Government Mall as we have outlined in the articles listed above. Let us now examine the more important salient facts about this Pentagram formed on the ground by these shootings. * The original Broken Cross remains intact; as you can see with a close examination of the manner in which this Broken Cross fits at the very top of the pyramid. Shot #6 forms the bottom location of the Broken Cross. This shot is seemingly out of sequence as it does not fall on any line; however, this shot location falls almost exactly within the middle of the top pyramid of this Pentagram. Therefore, it is in the perfect spot to be an All-Seeing Eye within a pyramid! 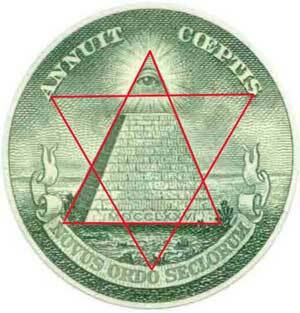 As you can see from examining this symbol of the All-Seeing Eye hovering over the unfinished pyramid that is on the back of the U.S. One Dollar Bill, this placement of the symbolism is most important to the Illuminati. Shot #6 is the All-Seeing Eye of this topmost pyramid of the Pentagram! * Fredericksburg forms the lower West point of this Pentagram. At first, I was puzzled why the shooter killed two people at this point -- Shots #8 and #11. Only one shot would have been needed to cement this location. It seemed that the shooter was wanting to emphasize this lower left point by committing two murders there. A former Satanist pointed out to me that this emphasis at the lower left point demonstrated that this Pentagram was being created by the evil, Left Hand Path type of Satanist, the Black Magick practitioner! Of course, this interpretation is fully in line with the Death Tarot Card -- Card #13 in the Tarot Deck -- that the shooter left at the Shot #9 location. The Death Tarot Card speaks of the evil Left Hand Path. * As we stated in NEWS1710, our first article calling your attention to the Broken Cross being formed on the ground, we told you the primary purpose of the Pentagram. Listen as we quote Dr. Cathy Burns in her book, "Hidden Secrets of the Eastern Star", p. 327; Dr. Burns is quoting a Masonic book on witchcraft. Therefore, this Pentagram might have been drawn on the ground with these shooting locations in order for a powerful Illuminist ritual to be performed that would conjure up demons and tempests. The United States is leading the world into a "tempest" right now, are we not, in Iraq? Further, the plan calls for deliberately provoked internal disasters and "tempests" within the United States that will provide the excuse to suspend our Constitutional Government, our liberties, and our freedoms, all in the name of restoring order and fighting terrorism. Listen now to an explanation as to how a witch creates the Pentagram in preparation to use it in a ritual. Thus, "magical space" has been created on the ground by the shootings that form this Pentagram. Now, "Craft Ritual" may commence. Tomorrow is October 13, a most likely time in which to carry out such a secret ritual. Also, remember how important October is to the Satanist; they believe October is the month in which the "membrane" separating the demonic realm from this material realm is the thinnest, allowing the easiest entry of demonic spirits into this dimension. The day and night of Halloween -- Samhain -- is the most critical moment of the year, for that night the membrane is absolutely the thinnest. 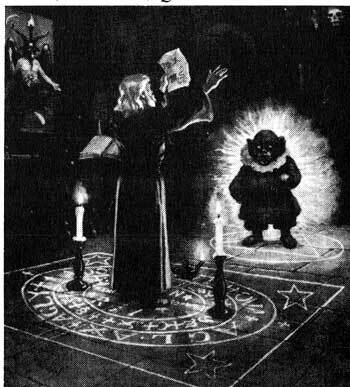 Therefore, we can be assured that the ritual that will be carried out will be one in which powerful demons will be called forth. Remember, as this picture illustrates, one of the main purpose of many rituals is to physically "draw down" a demon into this dimension. Since this Pentagram encompasses all the Satanic symbols on the ground in Government Mall, a most powerful vortex of demonic activity could come pouring right through the middle of this Pentagram to do the bidding of the powerful Illuminist witch actually performing the ceremony. What kind of ceremony might the witch be performing and for what purpose? A look back at the Pentagram and the Broken Cross gives us a strong indication, and the news is not good for Fundamentalist Christians, who comprise the only enemy the Illuminati fears. They do not fear the Liberal, Evangelical Christian for these types of Christians are either too far removed from the Bible to pose any threat, or they are convinced that no bad thing will happen to them before the Rapture of the Church. But, the Fundamentalist Christian, who knows spiritual warfare based upon the Bible, and who has used this knowledge to accurately look at the leaders and the events of the day, is the Illuminist's greatest fear. Let us now look again at this Pentagram. This "king" is none other than Antichrist. God will allow him and his plan to "prosper" until all of God's prophecies are fulfilled. While most Evangelical Christians smugly believe that no persecution will befall Christians until after Antichrist is arisen and has confirmed the covenant with Israel, we are no so sure. For Antichrist to even arise, the world has to go through the final Birth Pangs -- "Sorrows" of Matthew 24:8. These final Birth Sorrows will be wars, rumors of wars, nation rising against nation, kingdom against kingdom. The Illuminati plans these final Birth Sorrows, and they call it World War III. The Christian is likely to go through this World War III and we believe it will feel like the "bad" events of Revelation. This next verse tells us how thoroughly God will allow Satan to prevail over God's people. Even though this verse most definitely applies specifically to the last half of the Tribulation Period, it does demonstrate God's intention to allow Antichrist to almost annihilate the people who love God and who have received Jesus Christ as Savior. This symbol of the Broken Cross demonstrates the hatred of Satanists for Christians; will God allow the planned annihilation to begin to occur as the Final Birth Sorrows to produce Antichrist commence? We have to wait to see how God allows events to unfold, but we must be prepared for the distinct possibility that this annihilation of Christians might begin during the Birth Sorrow period. God reveals that His Throne is located in the "uttermost north". Therefore, Satanists have always despised the north direction, worshipping instead toward the East, as they worship the Sun at its rising. Thus, the symbolism of the Broken Cross formed by these shootings being located at the uppermost north pyramid of this Pentagram is positively huge! Literally, the Christian Church is to be annihilated through a powerful ritual performed somewhere in the midst of the Pentagram. Further, the force that is going to be smashing the Christian Church is represented by the location of Shot #6, which is in the middle of this northern Pentagram point. As we stated earlier, this location is perfect for the All-Seeing Eye. As we prove in Seminar 2, "America Determines The Flow of History", the eye hovering over the unfinished Pyramid in the symbol on the back of our One Dollar Bill is Lucifer! Therefore, Lucifer is behind this planned smashing of the Christian Church, as he works through his Masters of the Illuminati. Thus, Christianity, as depicted by the Broken Cross, is laying on a triangular Satanic altar! Of course, the bottom right point is facing East. Thus, we have a picture we cannot ignore in this symbolism. The Illuminati plans to begin their annihilation of the Christian Church. To symbolize this fact, they have placed the symbol of a defeated, destroyed Christianity on a Satanic altar shaped as a triangle, facing north! But, the Illuminati did not just place a symbol on the ground to communicate this plan to the adepts and initiates of the occult throughout the world. They constructed a powerful Pentagram on the ground so that a powerful Illuminist witch can actually perform an incredibly powerful Satanic ritual in which the most powerful demons can come pouring through the "portal" created by the ritual; of course, this "portal" is created during the month of October when Satanists believe the membrane separating the demonic realm from this material realm is the thinnest. This shooting event is thus a most powerful event in the world of the occult, with terrible repercussions for Born Again Christians. Before we close this article, I want to point out some very interesting "coincidences". Remember that the Illuminati creates their plans with the aid of their demonic "Guiding Spirits", demons whom God has allowed limited foreknowledge. For example, Masonic leader Albert Pike received a demonic vision in 1870 that told him three world wars would be needed to stage Antichrist [Read NEWS1056]. The first two world wars occurred just as Pike was told they would, and the stage is exactly set for the third world war. The Illuminati has been known to plan events 200 years in advance! Thus, it was with great interest that, on this map, I noticed the names of two very important individuals to the Illuminati. Charles -- Notice that, at the bottom two points of the Pentagram, the name of "Charles" appears! As demonstrated by the book, "Antichrist And A Cup of Tea", Prince Charles fits the requirements of the man who would be Antichrist far better than anyone else on earth. Prince Charles is the Illuminati's Plan 'A'. Prince William -- Notice that, just below the town of Manassas, the name of Prince William occurs. Prince William is Charles' oldest son, who turns 30 years of age on 2012. If the Illuminati cannot stage Antichrist right now, Prince William will be their Plan 'B'. Alexandria is located almost exactly in the heart and soul of this Pentagram. Alexandria, Virginia, is the sister city of the Egyptian Alexandria, which was renowned for the power of its Satanism during the time of Ancient Egypt. It's streets are laid out in the same pattern, and the same spirits were invoked when Alexandria, Virginia was established. Systematically, every key government building built from the late 1700's through the middle the administration of Franklin Roosevelt was consecrated in a Masonic cornerstone laying ceremony, utilizing pagan symbols and pagan doctrine, and carried out in accordance with a horoscope cast to determine the most propitious day and time of day to carry out the dedication ceremony. "She is fallen! Mighty Babylon is fallen! She has become a resort and dwelling place for demons, a dungeon haunted by every loathsome spirit, an abode for every filthy and detestable bird. For all nations have drunk the wine of her passionate unchastity, and the rulers and leaders of the earth have joined with her in committing fornication (idolatry), and the businessmen of the earth have become rich with the wealth of her excessive luxury and wantonness. I then heard another voice from heaven saying, Come out from her, my people, so that you may not share in her sins, neither participate in her plagues. For her iniquities (her crimes and transgressions) are piled up as high as heaven, and God has remembered her wickedness and [her] crimes [and calls them up for settlement]. What is your spiritual condition before God? Are you truly Born Again, and living in total submission to His Word? Or, are you still pursuing that career and that investment portfolio, placing them as the #1 love of your life. If you are not Born Again and sold out for Jesus Christ, you have every reason to be terrified.